This article is about the chemical element. For other uses, see Chlorine (disambiguation). "Cl" and "Cl2" redirect here. For other uses, see CL (disambiguation) and CL2 (disambiguation). Scheele observed several of the properties of chlorine: the bleaching effect on litmus, the deadly effect on insects, the yellow-green color, and the smell similar to aqua regia. He called it "dephlogisticated muriatic acid air" since it is a gas (then called "airs") and it came from hydrochloric acid (then known as "muriatic acid"). He failed to establish chlorine as an element. Common chemical theory at that time held that an acid is a compound that contains oxygen (remnants of this survive in the German and Dutch names of oxygen: sauerstoff or zuurstof, both translating into English as acid substance), so a number of chemists, including Claude Berthollet, suggested that Scheele's dephlogisticated muriatic acid air must be a combination of oxygen and the yet undiscovered element, muriaticum. In 1809, Joseph Louis Gay-Lussac and Louis-Jacques Thénard tried to decompose dephlogisticated muriatic acid air by reacting it with charcoal to release the free element muriaticum (and carbon dioxide). They did not succeed and published a report in which they considered the possibility that dephlogisticated muriatic acid air is an element, but were not convinced. In 1810, Sir Humphry Davy tried the same experiment again, and concluded that the substance was an element, and not a compound. He announced his results to the Royal Society on 15 November that year. At that time, he named this new element "chlorine", from the Greek word χλωρος (chlōros), meaning green-yellow. The name "halogen", meaning "salt producer", was originally used for chlorine in 1811 by Johann Salomo Christoph Schweigger. This term was later used as a generic term to describe all the elements in the chlorine family (fluorine, bromine, iodine), after a suggestion by Jöns Jakob Berzelius in 1826. In 1823, Michael Faraday liquefied chlorine for the first time, and demonstrated that what was then known as "solid chlorine" had a structure of chlorine hydrate (Cl2·H2O). Chlorine gas was first used by French chemist Claude Berthollet to bleach textiles in 1785. Modern bleaches resulted from further work by Berthollet, who first produced sodium hypochlorite in 1789 in his laboratory in the town of Javel (now part of Paris, France), by passing chlorine gas through a solution of sodium carbonate. The resulting liquid, known as "Eau de Javel" ("Javel water"), was a weak solution of sodium hypochlorite. This process was not very efficient, and alternative production methods were sought. Scottish chemist and industrialist Charles Tennant first produced a solution of calcium hypochlorite ("chlorinated lime"), then solid calcium hypochlorite (bleaching powder). These compounds produced low levels of elemental chlorine and could be more efficiently transported than sodium hypochlorite, which remained as dilute solutions because when purified to eliminate water, it became a dangerously powerful and unstable oxidizer. Near the end of the nineteenth century, E. S. Smith patented a method of sodium hypochlorite production involving electrolysis of brine to produce sodium hydroxide and chlorine gas, which then mixed to form sodium hypochlorite. This is known as the chloralkali process, first introduced on an industrial scale in 1892, and now the source of most elemental chlorine and sodium hydroxide. In 1884 Chemischen Fabrik Griesheim of Germany developed another chloralkali process which entered commercial production in 1888. 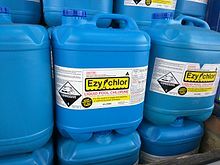 Elemental chlorine solutions dissolved in chemically basic water (sodium and calcium hypochlorite) were first used as anti-putrefaction agents and disinfectants in the 1820s, in France, long before the establishment of the germ theory of disease. This practice was pioneered by Antoine-Germain Labarraque, who adapted Berthollet's "Javel water" bleach and other chlorine preparations (for a more complete history, see below). Elemental chlorine has since served a continuous function in topical antisepsis (wound irrigation solutions and the like) and public sanitation, particularly in swimming and drinking water. Chlorine gas was first used as a weapon on April 22, 1915, at Ypres by the German Army. The effect on the allies was devastating because the existing gas masks were difficult to deploy and had not been broadly distributed. All four stable halogens experience intermolecular van der Waals forces of attraction, and their strength increases together with the number of electrons among all homonuclear diatomic halogen molecules. Thus, the melting and boiling points of chlorine are intermediate between those of fluorine and bromine: chlorine melts at −101.0 °C and boils at −34.0 °C. As a result of the increasing molecular weight of the halogens down the group, the density and heats of fusion and vaporisation of chlorine are again intermediate between those of bromine and fluorine, although all their heats of vaporisation are fairly low (leading to high volatility) thanks to their diatomic molecular structure. The halogens darken in colour as the group is descended: thus, while fluorine is a pale yellow gas, chlorine is distinctly yellow-green. This trend occurs because the wavelengths of visible light absorbed by the halogens increase down the group. Specifically, the colour of a halogen, such as chlorine, results from the electron transition between the highest occupied antibonding πg molecular orbital and the lowest vacant antibonding σu molecular orbital. The colour fades at low temperatures, so that solid chlorine at −195 °C is almost colourless. Like solid bromine and iodine, solid chlorine crystallises in the orthorhombic crystal system, in a layered lattice of Cl2 molecules. The Cl–Cl distance is 198 pm (close to the gaseous Cl–Cl distance of 199 pm) and the Cl···Cl distance between molecules is 332 pm within a layer and 382 pm between layers (compare the van der Waals radius of chlorine, 180 pm). This structure means that chlorine is a very poor conductor of electricity, and indeed its conductivity is so low as to be practically unmeasurable. Chlorine has two stable isotopes, 35Cl and 37Cl. These are its only two natural isotopes occurring in quantity, with 35Cl making up 76% of natural chlorine and 37Cl making up the remaining 24%. Both are synthesised in stars in the oxygen-burning and silicon-burning processes. Both have nuclear spin 3/2+ and thus may be used for nuclear magnetic resonance, although the spin magnitude being greater than 1/2 results in non-spherical nuclear charge distribution and thus resonance broadening as a result of a nonzero nuclear quadrupole moment and resultant quadrupolar relaxation. The other chlorine isotopes are all radioactive, with half-lives too short to occur in nature primordially. Of these, the most commonly used in the laboratory are 36Cl (t1/2 = 3.0×105 y) and 38Cl (t1/2 = 37.2 min), which may be produced from the neutron activation of natural chlorine. The most stable chlorine radioisotope is 36Cl. The primary decay mode of isotopes lighter than 35Cl is electron capture to isotopes of sulfur; that of isotopes heavier than 37Cl is beta decay to isotopes of argon; and 36Cl may decay by either mode to stable 36S or 36Ar. 36Cl occurs in trace quantities in nature as a cosmogenic nuclide in a ratio of about (7–10) × 10−13 to 1 with stable chlorine isotopes: it is produced in the atmosphere by spallation of 36Ar by interactions with cosmic ray protons. In the top meter of the lithosphere, 36Cl is generated primarily by thermal neutron activation of 35Cl and spallation of 39K and 40Ca. In the subsurface environment, muon capture by 40Ca becomes more important as a way to generate 36Cl. Chlorine is intermediate in reactivity between fluorine and bromine, and is one of the most reactive elements. Chlorine is a weaker oxidising agent than fluorine but a stronger one than bromine or iodine. This can be seen from the standard electrode potentials of the X2/X− couples (F, +2.866 V; Cl, +1.395 V; Br, +1.087 V; I, +0.615 V; At, approximately +0.3 V). However, this trend is not shown in the bond energies because fluorine is singular due to its small size, low polarisability, and lack of low-lying d-orbitals available for bonding (which chlorine has). As another difference, chlorine has a significant chemistry in positive oxidation states while fluorine does not. Chlorination often leads to higher oxidation states than bromination or iodination but lower oxidation states than fluorination. Chlorine tends to react with compounds including M–M, M–H, or M–C bonds to form M–Cl bonds. Given that E°(1/2O2/H2O) = +1.229 V, which is less than +1.395 V, it would be expected that chlorine should be able to oxidise water to oxygen and hydrochloric acid. However, the kinetics of this reaction are unfavorable, and there is also a bubble overpotential effect to consider, so that electrolysis of aqueous chloride solutions evolves chlorine gas and not oxygen gas, a fact that is very useful for the industrial production of chlorine. In the laboratory, hydrogen chloride gas may be made by drying the acid with concentrated sulfuric acid. Deuterium chloride, DCl, may be produced by reacting benzoyl chloride with heavy water (D2O). At room temperature, hydrogen chloride is a colourless gas, like all the hydrogen halides apart from hydrogen fluoride, since hydrogen cannot form strong hydrogen bonds to the larger electronegative chlorine atom; however, weak hydrogen bonding is present in solid crystalline hydrogen chloride at low temperatures, similar to the hydrogen fluoride structure, before disorder begins to prevail as the temperature is raised. Hydrochloric acid is a strong acid (pKa = −7) because the hydrogen bonds to chlorine are too weak to inhibit dissociation. The HCl/H2O system has many hydrates HCl·nH2O for n = 1, 2, 3, 4, and 6. Beyond a 1:1 mixture of HCl and H2O, the system separates completely into two separate liquid phases. Hydrochloric acid forms an azeotrope with boiling point 108.58 °C at 20.22 g HCl per 100 g solution; thus hydrochloric acid cannot be concentrated beyond this point by distillation. Nearly all elements in the periodic table form binary chlorides. The exceptions are decidedly in the minority and stem in each case from one of three causes: extreme inertness and reluctance to participate in chemical reactions (the noble gases, with the exception of xenon in the highly unstable XeCl2 and XeCl4); extreme nuclear instability hampering chemical investigation before decay and transmutation (many of the heaviest elements beyond bismuth); and having an electronegativity higher than chlorine's (oxygen and fluorine) so that the resultant binary compounds are formally not chlorides but rather oxides or fluorides of chlorine. Most of the chlorides of the pre-transition metals (groups 1, 2, and 3, along with the lanthanides and actinides in the +2 and +3 oxidation states) are mostly ionic, while nonmetals tend to form covalent molecular chlorides, as do metals in high oxidation states from +3 and above. Silver chloride is very insoluble in water and is thus often used as a qualitative test for chlorine. 3, has also been characterised; it is analogous to triiodide. 2, and Cl2F+. Some pseudohalides of chlorine are also known, such as cyanogen chloride (ClCN, linear), chlorine cyanate (ClNCO), chlorine thiocyanate (ClSCN, unlike its oxygen counterpart), and chlorine azide (ClN3). The product, chloryl fluoride, is one of the five known chlorine oxide fluorides. These range from the thermally unstable FClO to the chemically unreactive perchloryl fluoride (FClO3), the other three being FClO2, F3ClO, and F3ClO2. All five behave similarly to the chlorine fluorides, both structurally and chemically, and may act as Lewis acids or bases by gaining or losing fluoride ions respectively or as very strong oxidising and fluorinating agents. Yellow chlorine dioxide (ClO2) gas above a yellow chlorine dioxide solution. Solutions of pure chlorine dioxide are dark green: this solution is yellow due to impurities produced from its photodecomposition. The chlorine oxides are well-studied in spite of their instability (all of them are endothermic compounds). They are important because they are produced when chlorofluorocarbons undergo photolysis in the upper atmosphere and cause the destruction of the ozone layer. None of them can be made from directly reacting the elements. Dichlorine monoxide (Cl2O) is a brownish-yellow gas (red-brown when solid or liquid) which may be obtained by reacting chlorine gas with yellow mercury(II) oxide. It is very soluble in water, in which it is in equilibrium with hypochlorous acid (HOCl), of which it is the anhydride. It is thus an effective bleach and is mostly used to make hypochlorites. It explodes on heating or sparking or in the presence of ammonia gas. Chlorine perchlorate (ClOClO3) is a pale yellow liquid that is less stable than ClO2 and decomposes at room temperature to form chlorine, oxygen, and dichlorine hexoxide (Cl2O6). 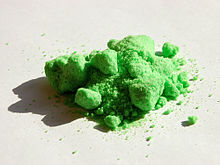 Chlorine perchlorate may also be considered a chlorine derivative of perchloric acid (HOClO3), similar to the thermally unstable chlorine derivatives of other oxoacids: examples include chlorine nitrate (ClONO2, vigorously reactive and explosive), and chlorine fluorosulfate (ClOSO2F, more stable but still moisture-sensitive and highly reactive). Dichlorine hexoxide is a dark-red liquid that freezes to form a solid which turns yellow at −180 °C: it is usually made by reaction of chlorine dioxide with oxygen. Despite attempts to rationalise it as the dimer of ClO3, it reacts more as though it were chloryl perchlorate, [ClO2]+[ClO4]−, which has been confirmed to be the correct structure of the solid. It hydrolyses in water to give a mixture of chloric and perchloric acids: the analogous reaction with anhydrous hydrogen fluoride does not proceed to completion. Dichlorine heptoxide (Cl2O7) is the anhydride of perchloric acid (HClO4) and can readily be obtained from it by dehydrating it with phosphoric acid at −10 °C and then distilling the product at −35 °C and 1 mmHg. It is a shock-sensitive, colourless oily liquid. It is the least reactive of the chlorine oxides, being the only one to not set organic materials on fire at room temperature. It may be dissolved in water to regenerate perchloric acid or in aqueous alkalis to regenerate perchlorates. However, it thermally decomposes explosively by breaking one of the central Cl–O bonds, producing the radicals ClO3 and ClO4 which immediately decompose to the elements through intermediate oxides. 4) but this is still very slow even at 100 °C despite the very favourable equilibrium constant of 1020. The rates of reaction for the chlorine oxyanions increases as the oxidation state of chlorine decreases. The strengths of the chlorine oxyacids increase very quickly as the oxidation state of chlorine increases due to the increasing delocalisation of charge over more and more oxygen atoms in their conjugate bases. Like the other carbon–halogen bonds, the C–Cl bond is a common functional group that forms part of core organic chemistry. Formally, compounds with this functional group may be considered organic derivatives of the chloride anion. Due to the difference of electronegativity between chlorine (3.16) and carbon (2.55), the carbon in a C–Cl bond is electron-deficient and thus electrophilic. Chlorination modifies the physical properties of hydrocarbons in several ways: chlorocarbons are typically denser than water due to the higher atomic weight of chlorine versus hydrogen, and aliphatic organochlorides are alkylating agents because chloride is a leaving group. Alkanes and aryl alkanes may be chlorinated under free-radical conditions, with UV light. However, the extent of chlorination is difficult to control: the reaction is not regioselective and often results in a mixture of various isomers with different degrees of chlorination, though this may be permissible if the products are easily separated. Aryl chlorides may be prepared by the Friedel-Crafts halogenation, using chlorine and a Lewis acid catalyst. The haloform reaction, using chlorine and sodium hydroxide, is also able to generate alkyl halides from methyl ketones, and related compounds. Chlorine adds to the multiple bonds on alkenes and alkynes as well, giving di- or tetra-chloro compounds. However, due to the expense and reactivity of chlorine, organochlorine compounds are more commonly produced by using hydrogen chloride, or with chlorinating agents such as phosphorus pentachloride (PCl5) or thionyl chloride (SOCl2). The last is very convenient in the laboratory because all side products are gaseous and do not have to be distilled out. Many organochlorine compounds have been isolated from natural sources ranging from bacteria to humans. Chlorinated organic compounds are found in nearly every class of biomolecules including alkaloids, terpenes, amino acids, flavonoids, steroids, and fatty acids. Organochlorides, including dioxins, are produced in the high temperature environment of forest fires, and dioxins have been found in the preserved ashes of lightning-ignited fires that predate synthetic dioxins. In addition, a variety of simple chlorinated hydrocarbons including dichloromethane, chloroform, and carbon tetrachloride have been isolated from marine algae. A majority of the chloromethane in the environment is produced naturally by biological decomposition, forest fires, and volcanoes. Some types of organochlorides, though not all, have significant toxicity to plants or animals, including humans. Dioxins, produced when organic matter is burned in the presence of chlorine, and some insecticides, such as DDT, are persistent organic pollutants which pose dangers when they are released into the environment. For example, DDT, which was widely used to control insects in the mid 20th century, also accumulates in food chains, and causes reproductive problems (e.g., eggshell thinning) in certain bird species. Due to the ready homolytic fission of the C–Cl bond to create chlorine radicals in the upper atmosphere, chlorofluorocarbons have been phased out due to the harm they do to the ozone layer. Chlorine is too reactive to occur as the free element in nature but is very abundant in the form of its chloride salts. It is the twentieth most abundant element in Earth's crust and makes up 126 parts per million of it, through the large deposits of chloride minerals, especially sodium chloride, that have been evaporated from water bodies. All of these pale in comparison to the reserves of chloride ions in seawater: smaller amounts at higher concentrations occur in some inland seas and underground brine wells, such as the Great Salt Lake in Utah and the Dead Sea in Israel. In diaphragm cell electrolysis, an asbestos (or polymer-fiber) diaphragm separates a cathode and an anode, preventing the chlorine forming at the anode from re-mixing with the sodium hydroxide and the hydrogen formed at the cathode. The salt solution (brine) is continuously fed to the anode compartment and flows through the diaphragm to the cathode compartment, where the caustic alkali is produced and the brine is partially depleted. Diaphragm methods produce dilute and slightly impure alkali, but they are not burdened with the problem of mercury disposal and they are more energy efficient. Membrane cell electrolysis employs permeable membrane as an ion exchanger. Saturated sodium (or potassium) chloride solution is passed through the anode compartment, leaving at a lower concentration. This method also produces very pure sodium (or potassium) hydroxide but has the disadvantage of requiring very pure brine at high concentrations. The reaction requires a catalyst. As introduced by Deacon, early catalysts were based on copper. Commercial processes, such as the Mitsui MT-Chlorine Process, have switched to chromium and ruthenium-based catalysts. The chlorine produced is available in cylinders from sizes ranging from 450 g to 70 kg, as well as drums (865 kg), tank wagons (15 tonnes on roads; 27–90 tonnes by rail), and barges (600–1200 tonnes). Sodium chloride is by a huge margin the most common chlorine compound, and it is the main source of chlorine and hydrochloric acid for the enormous chlorine-chemicals industry today. About 15000 chlorine-containing compounds are commercially traded, including such diverse compounds as chlorinated methanes and ethanes, vinyl chloride and its polymer polyvinyl chloride (PVC), aluminium trichloride for catalysis, the chlorides of magnesium, titanium, zirconium, and hafnium which are the precursors for producing the pure elements, and so on. Quantitatively, of all elemental chlorine produced, about 63% is used in the manufacture of organic compounds, and 18% in the manufacture of inorganic chlorine compounds. About 15,000 chlorine compounds are used commercially. The remaining 19% of chlorine produced is used for bleaches and disinfection products. The most significant of organic compounds in terms of production volume are 1,2-dichloroethane and vinyl chloride, intermediates in the production of PVC. Other particularly important organochlorines are methyl chloride, methylene chloride, chloroform, vinylidene chloride, trichloroethylene, perchloroethylene, allyl chloride, epichlorohydrin, chlorobenzene, dichlorobenzenes, and trichlorobenzenes. The major inorganic compounds include HCl, Cl2O, HOCl, NaClO3, chlorinated isocyanurates, AlCl3, SiCl4, SnCl4, PCl3, PCl5, POCl3, AsCl3, SbCl3, SbCl5, BiCl3, S2Cl2, SCl2, SOCI2, ClF3, ICl, ICl3, TiCl3, TiCl4, MoCl5, FeCl3, ZnCl2, and so on. In France (as elsewhere), animal intestines were processed to make musical instrument strings, Goldbeater's skin and other products. This was done in "gut factories" (boyauderies), and it was an odiferous and unhealthy process. In or about 1820, the Société d'encouragement pour l'industrie nationale offered a prize for the discovery of a method, chemical or mechanical, for separating the peritoneal membrane of animal intestines without putrefaction. The prize was won by Antoine-Germain Labarraque, a 44-year-old French chemist and pharmacist who had discovered that Berthollet's chlorinated bleaching solutions ("Eau de Javel") not only destroyed the smell of putrefaction of animal tissue decomposition, but also actually retarded the decomposition. Labarraque's research resulted in the use of chlorides and hypochlorites of lime (calcium hypochlorite) and of sodium (sodium hypochlorite) in the boyauderies. The same chemicals were found to be useful in the routine disinfection and deodorization of latrines, sewers, markets, abattoirs, anatomical theatres, and morgues. They were successful in hospitals, lazarets, prisons, infirmaries (both on land and at sea), magnaneries, stables, cattle-sheds, etc. ; and they were beneficial during exhumations, embalming, outbreaks of epidemic disease, fever, and blackleg in cattle. Labarraque's chlorinated lime and soda solutions have been advocated since 1828 to prevent infection (called "contagious infection", presumed to be transmitted by "miasmas"), and to treat putrefaction of existing wounds, including septic wounds. In his 1828 work, Labarraque recommended that doctors breathe chlorine, wash their hands in chlorinated lime, and even sprinkle chlorinated lime about the patients' beds in cases of "contagious infection". In 1828, the contagion of infections was well known, even though the agency of the microbe was not discovered until more than half a century later. Perhaps the most famous application of Labarraque's chlorine and chemical base solutions was in 1847, when Ignaz Semmelweis used chlorine-water (chlorine dissolved in pure water, which was cheaper than chlorinated lime solutions) to disinfect the hands of Austrian doctors, which Semmelweis noticed still carried the stench of decomposition from the dissection rooms to the patient examination rooms. Long before the germ theory of disease, Semmelweis theorized that "cadaveric particles" were transmitting decay from fresh medical cadavers to living patients, and he used the well-known "Labarraque's solutions" as the only known method to remove the smell of decay and tissue decomposition (which he found that soap did not). The solutions proved to be far more effective antiseptics than soap (Semmelweis was also aware of their greater efficacy, but not the reason), and this resulted in Semmelweis's celebrated success in stopping the transmission of childbed fever ("puerperal fever") in the maternity wards of Vienna General Hospital in Austria in 1847. Much later, during World War I in 1916, a standardized and diluted modification of Labarraque's solution containing hypochlorite (0.5%) and boric acid as an acidic stabilizer, was developed by Henry Drysdale Dakin (who gave full credit to Labarraque's prior work in this area). Called Dakin's solution, the method of wound irrigation with chlorinated solutions allowed antiseptic treatment of a wide variety of open wounds, long before the modern antibiotic era. A modified version of this solution continues to be employed in wound irrigation in modern times, where it remains effective against bacteria that are resistant to multiple antibiotics (see Century Pharmaceuticals). The first continuous application of chlorination to drinking U.S. water was installed in Jersey City, New Jersey in 1908. By 1918, the US Department of Treasury called for all drinking water to be disinfected with chlorine. Chlorine is presently an important chemical for water purification (such as in water treatment plants), in disinfectants, and in bleach. Even small water supplies are now routinely chlorinated. Chlorine is usually used (in the form of hypochlorous acid) to kill bacteria and other microbes in drinking water supplies and public swimming pools. In most private swimming pools, chlorine itself is not used, but rather sodium hypochlorite, formed from chlorine and sodium hydroxide, or solid tablets of chlorinated isocyanurates. The drawback of using chlorine in swimming pools is that the chlorine reacts with the proteins in human hair and skin. The distinctive 'chlorine aroma' associated with swimming pools is not the result of chlorine itself, but of chloramine, a chemical compound produced by the reaction of free dissolved chlorine with amines in organic substances. As a disinfectant in water, chlorine is more than three times as effective against Escherichia coli as bromine, and more than six times as effective as iodine. Increasingly, chloramine itself is being directly added to drinking water for purposes of disinfection, a process known as chloramination. It is often impractical to store and use poisonous chlorine gas for water treatment, so alternative methods of adding chlorine are used. These include hypochlorite solutions, which gradually release chlorine into the water, and compounds like sodium dichloro-s-triazinetrione (dihydrate or anhydrous), sometimes referred to as "dichlor", and trichloro-s-triazinetrione, sometimes referred to as "trichlor". These compounds are stable while solid and may be used in powdered, granular, or tablet form. When added in small amounts to pool water or industrial water systems, the chlorine atoms hydrolyze from the rest of the molecule forming hypochlorous acid (HOCl), which acts as a general biocide, killing germs, micro-organisms, algae, and so on. Chlorine gas, also known as bertholite, was first used as a weapon in World War I by Germany on April 22, 1915 in the Second Battle of Ypres. As described by the soldiers, it had the distinctive smell of a mixture of pepper and pineapple. It also tasted metallic and stung the back of the throat and chest. Chlorine reacts with water in the mucosa of the lungs to form hydrochloric acid, destructive to living tissue and potentially lethal. Human respiratory systems can be protected from chlorine gas by gas masks with activated charcoal or other filters, which makes chlorine gas much less lethal than other chemical weapons. It was pioneered by a German scientist later to be a Nobel laureate, Fritz Haber of the Kaiser Wilhelm Institute in Berlin, in collaboration with the German chemical conglomerate IG Farben, which developed methods for discharging chlorine gas against an entrenched enemy. After its first use, both sides in the conflict used chlorine as a chemical weapon, but it was soon replaced by the more deadly phosgene and mustard gas. Chlorine gas was also used during the Iraq War in Anbar Province in 2007, with insurgents packing truck bombs with mortar shells and chlorine tanks. The attacks killed two people from the explosives and sickened more than 350. Most of the deaths were caused by the force of the explosions rather than the effects of chlorine since the toxic gas is readily dispersed and diluted in the atmosphere by the blast. In some bombings, over a hundred civilians were hospitalized due to breathing difficulties. The Iraqi authorities tightened security for elemental chlorine, which is essential for providing safe drinking water to the population. On 24 October 2014, it was reported that the Islamic State of Iraq and the Levant had used chlorine gas in the town of Duluiyah, Iraq. Laboratory analysis of clothing and soil samples confirmed the use of chlorine gas against Kurdish Peshmerga Forces in a vehicle-borne improvised explosive device attack on 23 January 2015 at the Highway 47 Kiske Junction near Mosul. The chloride anion is an essential nutrient for metabolism. Chlorine is needed for the production of hydrochloric acid in the stomach and in cellular pump functions. The main dietary source is table salt, or sodium chloride. Overly low or high concentrations of chloride in the blood are examples of electrolyte disturbances. Hypochloremia (having too little chloride) rarely occurs in the absence of other abnormalities. It is sometimes associated with hypoventilation. It can be associated with chronic respiratory acidosis. Hyperchloremia (having too much chloride) usually does not produce symptoms. When symptoms do occur, they tend to resemble those of hypernatremia (having too much sodium). Reduction in blood chloride leads to cerebral dehydration; symptoms are most often caused by rapid rehydration which results in cerebral edema. Hyperchloremia can affect oxygen transport. Chlorine is a toxic gas that attacks the respiratory system, eyes, and skin. Because it is denser than air, it tends to accumulate at the bottom of poorly ventilated spaces. Chlorine gas is a strong oxidizer, which may react with flammable materials. Chlorine is detectable with measuring devices in concentrations as low as 0.2 parts per million (ppm), and by smell at 3 ppm. Coughing and vomiting may occur at 30 ppm and lung damage at 60 ppm. About 1000 ppm can be fatal after a few deep breaths of the gas. The IDLH (immediately dangerous to life and health) concentration is 10 ppm. Breathing lower concentrations can aggravate the respiratory system and exposure to the gas can irritate the eyes. The toxicity of chlorine comes from its oxidizing power. When chlorine is inhaled at concentrations greater than 30 ppm, it reacts with water and cellular fluid, producing hydrochloric acid (HCl) and hypochlorous acid (HClO). In the United States, the Occupational Safety and Health Administration (OSHA) has set the permissible exposure limit for elemental chlorine at 1 ppm, or 3 mg/m3. The National Institute for Occupational Safety and Health has designated a recommended exposure limit of 0.5 ppm over 15 minutes. In the home, accidents occur when hypochlorite bleach solutions come into contact with certain acidic drain-cleaners to produce chlorine gas. Hypochlorite bleach (a popular laundry additive) combined with ammonia (another popular laundry additive) produces chloramines, another toxic group of chemicals. The element iron can combine with chlorine at high temperatures in a strong exothermic reaction, creating a chlorine-iron fire. Chlorine-iron fires are a risk in chemical process plants, where much of the pipework that carries chlorine gas is made of steel. ^ "The earliest salt production in the world: an early Neolithic exploitation in Poiana Slatinei-Lunca, Romania". Archived from the original on April 30, 2011. Retrieved 2008-07-10. ^ Scheele, Carl Wilhelm (1774). "Om Brunsten, eller Magnesia, och dess Egenskaper" [On braunstein [i.e., pyrolusite, manganese dioxide], or magnesia, and its properties]. Kongliga Vetenskaps Academiens Handlingar [Proceedings of the Royal Scientific Academy] (in Swedish). 35: 89–116, 177–194. In section 6 on pp. 93–94 of his paper, Scheele described how chlorine was produced when a mixture of hydrochloric acid and manganese dioxide (Brunsten) was heated: "6) (a) På 1/2 uns fint rifven Brunsten slogs 1 uns ren Spiritus salis. … samt lukten fo̊rsvunnen." ( 6) (a) On one half ounce of finely ground Braunstein [pyrolusite] was poured one ounce of pure spiritus salis [spirit of salt, hydrogen chloride]. After this mixture had been standing in the cold for one hour, the acid had assumed a dark brown colour. One part of this solution was poured into a glass, which was placed over the fire. The solution gave off an odour like warm aqua regia and after one quarter’s hour duration, it was as clear and colourless as water, and the smell had disappeared.) For an English translation of the relevant passages of this article, see: The Early History of Chlorine : Papers by Carl Wilhelm Scheele (1774), C. L. Berthollet (1785), Guyton de Morveau (1787), J. L. Gay-Lussac and L. J. Thenard (1809) (Edinburgh, Scotland: Alembic Club, 1912), pp. 5–10. ^ a b c d e "17 Chlorine". Elements.vanderkrogt.net. Archived from the original on 2010-01-23. Retrieved 2008-09-12. ^ Ihde, Aaron John (1984). The development of modern chemistry. Courier Dover Publications. p. 158. ISBN 978-0-486-64235-2. ^ Davy, Humphry (1811). "The Bakerian Lecture. On some of the combinations of oxymuriatic gas and oxygene, and on the chemical relations of these principles, to inflammable bodies". Philosophical Transactions of the Royal Society of London. 101: 1–35. Bibcode:1811RSPT..101....1D. doi:10.1098/rstl.1811.0001. Davy named chlorine on p. 32: "After consulting some of the most eminent chemical philosophers in this country, it has been judged most proper to suggest a name founded upon one of its obvious and characteristic properties — its colour, and to call it Chlorine, or Chloric gas. * *From χλωρος." ^ Snelders, H. A. M. (1971). "J. S. C. Schweigger: His Romanticism and His Crystal Electrical Theory of Matter". Isis. 62 (3): 328–338. doi:10.1086/350763. JSTOR 229946. ^ Faraday, M. (1823). "On fluid chlorine". Philosophical Transactions of the Royal Society of London. 113: 160–164. Bibcode:1823RSPT..113..160F. doi:10.1098/rstl.1823.0016. ^ Chodos, Alan (ed.). "This Month in Physics History September 4, 1821 and August 29, 1831: Faraday and Electromagnetism". American Physical Society. Archived from the original on June 15, 2010. Retrieved 2010-05-08. ^ O'Connor J. J.; Robertson E. F. "Michael Faraday". School of Mathematics and Statistics, University of St Andrews, Scotland. Archived from the original on 2010-02-20. Retrieved 2010-05-08. ^ a b "Bleaching". Encyclopædia Britannica (9th Edition (1875) and 10th Edition (1902) ed.). Archived from the original on 2012-05-24. Retrieved 2012-05-02. ^ Aspin, Chris (1981). The Cotton Industry. Shire Publications Ltd. p. 24. ISBN 978-0-85263-545-2. ^ Paul May. "Bleach (Sodium Hypochlorite)". University of Bristol. Archived from the original on 13 December 2016. Retrieved 13 December 2016. ^ Almqvist, Ebbe (2003). History of Industrial Gases. Springer Science & Business Media. p. 220. ISBN 978-0-306-47277-0. ^ Bouvet, Maurice (1950). "Les grands pharmaciens: Labarraque (1777–1850)" [The great pharmacists: Labarraque (1777–1850)]. Revue d'Histoire de la Pharmacie (in French). 38 (128): 97–107. doi:10.3406/pharm.1950.8662. ^ "Chlorine – History" (PDF). Archived from the original (PDF) on 21 February 2007. Retrieved 2008-07-10. ^ "Weaponry: Use of Chlorine Gas Cylinders in World War I". historynet.com. 2006-06-12. Archived from the original on 2008-07-02. Retrieved 2008-07-10. ^ Staff (29 July 2004). "On the Western Front, Ypres 1915". Veteran Affairs Canada. Archived from the original on 14 August 2011. Retrieved 2008-04-08. ^ Lefebure, Victor; Wilson, Henry (2004). The Riddle of the Rhine: Chemical Strategy in Peace and War. Kessinger Publishing. ISBN 978-1-4179-3546-8. ^ Cameron, A. G. W. (1973). "Abundance of the Elements in the Solar System" (PDF). Space Science Reviews. 15 (1): 121–46. Bibcode:1973SSRv...15..121C. doi:10.1007/BF00172440. Archived from the original (PDF) on 2011-10-21. ^ M. Zreda; et al. (1991). "Cosmogenic chlorine-36 production rates in terrestrial rocks". Earth and Planetary Science Letters. 105 (1–3): 94–109. Bibcode:1991E&PSL.105...94Z. doi:10.1016/0012-821X(91)90123-Y. ^ a b Gordon W. Gribble (1998). "Naturally Occurring Organohalogen Compounds". Acc. Chem. Res. 31 (3): 141–52. doi:10.1021/ar9701777. ^ Gordon W. Gribble (1999). "The diversity of naturally occurring organobromine compounds". Chemical Society Reviews. 28 (5): 335–46. doi:10.1039/a900201d. ^ Kjeld C. Engvild (1986). "Chlorine-Containing Natural Compounds in Higher Plants". Phytochemistry. 25 (4): 7891–791. doi:10.1016/0031-9422(86)80002-4. ^ Gribble, G. W. (1994). "The Natural production of chlorinated compounds". Environmental Science and Technology. 28 (7): 310A–319A. Bibcode:1994EnST...28..310G. doi:10.1021/es00056a712. PMID 22662801. ^ Connell, D.; et al. (1999). Introduction to Ecotoxicology. Blackwell Science. p. 68. ISBN 978-0-632-03852-7. ^ "The diaphragm cell process". Euro Chlor. Archived from the original on 2011-11-11. Retrieved 2007-08-15. ^ "The membrane cell process". Euro Chlor. Archived from the original on 2011-11-11. Retrieved 2007-08-15. ^ Greenwood 1997, p. 798. ^ Greenwood 1997, p. 793. ^ a b Hoefer, Jean Chrétien Ferdinand (ed.). "Labarraque, Antoine-Germain". Nouvelle biographie universelle. 28. pp. 323–24. OL 24229911M. ^ a b Knight, Charles (1867). Arts and sciences. 1. Bradbury, Evans & Co. p. 427. ^ Gédéon, Andras (2006). Science and technology in medicine. Springer. pp. 181–82. ISBN 978-0-387-27874-2. Archived from the original on 2015-12-31. ^ Labarraque, Antoine Germain (1828). On the disinfecting properties of Labarraque's preparations of chlorine. Translated by James Scott. p. 8. Archived from the original on 2015-12-31. ^ Scott, James (trans.). On the disinfecting properties of Labarraque's preparations of chlorine Archived 2015-12-31 at the Wayback Machine (S. Highley, 1828) Accessed Nov 1, 2011. ^ Corbin, Alain (1988). The Foul and the Fragrant: Odor and the French Social Imagination Archived 2015-12-31 at the Wayback Machine. Harvard University Press. pp. 121–22. ^ a b Vinten-Johansen, Peter, Howard Brody, Nigel Paneth, Stephen Rachman and Michael Rip. (2003). Cholera, Chloroform, and the Science of Medicine. New York:Oxford University. ^ Rezayat, C.; Widmann, W. D.; Hardy, M. A. (2006). "Henry Drysdale Dakin: More Than His Solution". Current Surgery. 63 (3): 194–96. doi:10.1016/j.cursur.2006.04.009. PMID 16757372. ^ Joseph Cotruvo, Victor Kimm, Arden Calvert. “Drinking Water: A Half Century of Progress.” EPA Alumni Association. March 1, 2016. ^ Hammond, C. R. (2000). The Elements, in Handbook of Chemistry and Physics (81st ed.). CRC press. ISBN 978-0-8493-0481-1. ^ Koski T. A.; Stuart L. S.; Ortenzio L. F. (1966). "Comparison of chlorine, bromine, iodine as disinfectants for swimming pool water". Applied Microbiology. 14 (2): 276–79. PMC 546668. PMID 4959984. ^ "Disinfection with chloramine". Centers for Disease Control and Prevention (CDC). Atlanta, Georgia, USA. Archived from the original on 2019-01-20. Retrieved 2019-01-20. ^ Greenwood 1997, p. 860. ^ Wiberg 2001, p. 411. ^ Everts, Sarah (February 23, 2015). "When Chemicals Became Weapons of War". Chemical & Engineering News. 93 (8). Archived from the original on March 30, 2016. ^ Smil, Vaclav (2004-04-01). Enriching the Earth: Fritz Haber, Carl Bosch, and the Transformation of World Food Production. p. 226. ISBN 978-0-262-69313-4. Archived from the original on 2015-12-31. ^ "Weapons of War: Poison Gas". First World War.com. Archived from the original on 2007-08-21. Retrieved 2007-08-12. ^ Mahdi, Basim (2007-03-17). "Iraq gas attack makes hundreds ill". CNN. Archived from the original on 2007-03-17. Retrieved 2007-03-17. ^ "'Chlorine bomb' hits Iraq village". BBC News. 2007-05-17. Archived from the original on 2010-12-20. Retrieved 2007-05-17. ^ "ISIS chlorine attack on security forces confirmed – Iraq officials". RT. October 24, 2014. Archived from the original on October 24, 2014. ^ "Lab report on chlorine gas usage" (PDF). Kurdistan Region Security Council. March 14, 2015. ^ Gladstone, Rick (2017-02-13). "Syria Used Chlorine Bombs Systematically in Aleppo, Report Says". The New York Times. Archived from the original on 2017-05-15. Retrieved 2017-05-10. ^ "Syrian forces 'drop chlorine' on Aleppo". BBC News. 2016-09-07. Archived from the original on 2017-05-13. Retrieved 2017-05-10. ^ "Ignoring UN, Russia and Assad continue Syrian chemical weapons and bombing attacks labeled war crimes". 2017-03-06. Archived from the original on 2017-04-25. Retrieved 2017-05-11. ^ "Blood (Serum) Chloride Level Test". Archived from the original on 31 March 2009. Retrieved 30 April 2010. ^ Lavie, CJ; Crocker, EF; Key, KJ; Ferguson, TG (October 1986). "Marked hypochloremic metabolic alkalosis with severe compensatory hypoventilation". South. Med. J. 79 (10): 1296–99. doi:10.1097/00007611-198610000-00025. PMID 3764530. ^ Levitin, H; Branscome, W; Epstein, FH (December 1958). "The pathogenesis of hypochloremia in respiratory acidosis". J. Clin. Invest. 37 (12): 1667–75. doi:10.1172/JCI103758. PMC 1062852. PMID 13611033. ^ Cambier, C; Detry, B; Beerens, D; et al. (October 1998). "Effects of hyperchloremia on blood oxygen binding in healthy calves". J. Appl. Physiol. 85 (4): 1267–72. doi:10.1152/jappl.1998.85.4.1267. PMID 9760315. ^ "Chlorine MSDS" (PDF). 1997-10-23. Archived from the original (PDF) on 2007-09-26. ^ NOAA Office of Response and Restoration, US GOV. "Chlorine". noaa.gov. Archived from the original on 15 October 2015. Retrieved 25 August 2015. ^ a b NIOSH Pocket Guide to Chemical Hazards. "#0115". National Institute for Occupational Safety and Health (NIOSH). ^ "What's in your Water? : Disinfectants Create Toxic By-products". ACES News. College of Agricultural, Consumer and Environmental Sciences – University of Illinois at Urbana-Champaign. 2009-03-31. Archived from the original on 2014-09-03. Retrieved 2009-03-31. ^ Berezow, Alex. "Why You Should Never Mix Different Drain Cleaners". Forbes. Archived from the original on 2016-04-25. Retrieved 2016-04-12. ^ "Bleach Mixing Dangers : Washington State Dept. of Health". www.doh.wa.gov. Archived from the original on 2016-04-14. Retrieved 2016-04-12. ^ Bertolini, Luca; Elsener, Bernhard; Pedeferri, Pietro; Polder, Rob B. (2004). Corrosion of steel in concrete: prevention, diagnosis, repair. Wiley-VCH. p. 148. ISBN 978-3-527-30800-2. ^ Lewis, P.R. (1 January 2000). Polymer Product Failure. iSmithers Rapra Publishing. pp. 19–. ISBN 978-1-85957-192-7. Archived from the original on 10 May 2013. Retrieved 2011-04-30. ^ a b "Chlorine: Product Datasheet" (PDF). Bayer MaterialScience AG. 2008-04-21. Archived from the original (PDF) on September 15, 2012. Retrieved 2013-12-17. ^ a b Sanders, Roy E. (2004). Chemical Process Safety: Learning from Case Histories, 3rd Revised edition. Oxford: Elsevier Science & Technology. p. 92. ISBN 978-0-7506-7749-3. Wikimedia Commons has media related to Chlorine. "Chlorine" . Encyclopædia Britannica. 6 (11th ed.). 1911. pp. 254–56.